Rosana McPhee shares this fresh and easy crab and lemon pennette rigate recipe, celebrating the bright, full flavours of spring. A delicious main that can be served both hot and cold – try it as a luxurious lunchtime treat at the weekend. Nothing welcomes in the change of seasons better than stocking up on a host of new ingredients available to cook with. 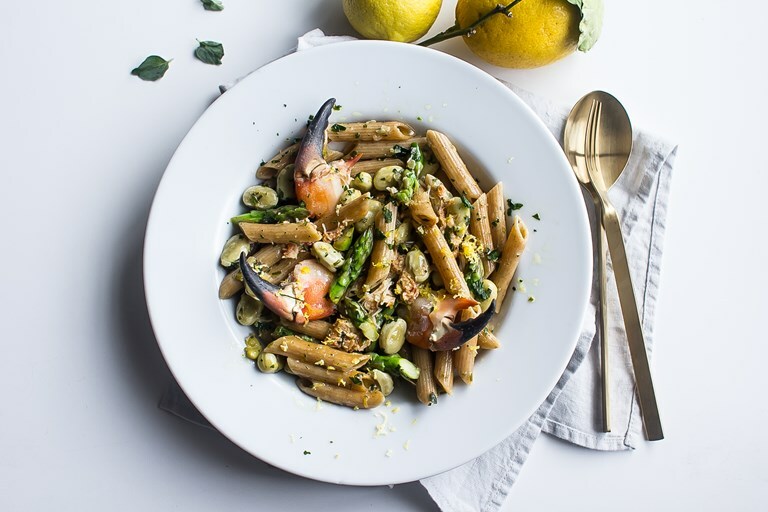 This delicious bowl of pasta has some of the best ingredients early springtime has to offer, including asparagus, broad beans, herbs, lemon and fresh crab claws paired with nutty and delicious whole wheat pennette rigate pasta, which holds sauces particularly well. Whole wheat pasta isn’t just tasty – it’s also rich in fibre, keeps you fuller for longer and can help lower cholesterol and blood pressure. If you’re looking for some inspiration for a new, luxurious pasta dish, then this light and healthy recipe laden with seafood is perfect for springtime.